If you enjoy picross (or nonograms, or whatever other name you may know these pixel-art logic puzzles), Pictopix is a game you need to buy. Until now, Jupiter Corporation – creators of Mario’s Picross and Picross e, among others – is the only developer that’s really done this puzzle form justice. Thanks to Thomas Leroy, there’s finally a PC picross game with the same degree of polish and professionalism, and I can’t recommend it highly enough. If you’re not familiar, picross puzzles are picture crosswords. You’ve got a grid that’s usually (but not always) square, with a set of numerical clues along each row and column. These numbers tell you how many cells should be filled in: a clue of “1” means that there’s just one square to be filled in and the rest left blank, while “2, 3, 7” means there should be groups of two, three, and seven filled squares, in that order, with at least one blank space between each group. With these clues, you can find cells that must be filled. For example, if you a clue of “8” on a row that’s 10 wide, there are only three possible positions for that group of 8 filled squares: 1 to 8, 2 to 9, or 3 to 10. In all of these cases, cells 3 to 8 are filled, so you know it’s safe to fill in those six even though you don’t know where the last two will go. With those six squares are filled in, previously unsolvable columns might now be possible – a column with “1” as its clue can safely have its remaining nine cells marked as blank. Thus goes the process of solving a picross puzzle. Using logic and process of elimination, you fill in and blank out cells until every square is marked. If you’ve done it correctly, the filled squares form a picture of some sort. As far as video games go, picross shouldn’t be too difficult to adapt. It’s quite simple on a mechanical level; the challenge is in the design of the puzzles themselves, and plenty of people have been able to rise to that challenge in the numerous printed books and magazines that are around. And yet, Jupiter Corp is one of the only devs that’s really been able to make it work, and with their focus almost exclusively on Nintendo 3DS these days, options for playing their games are limited. 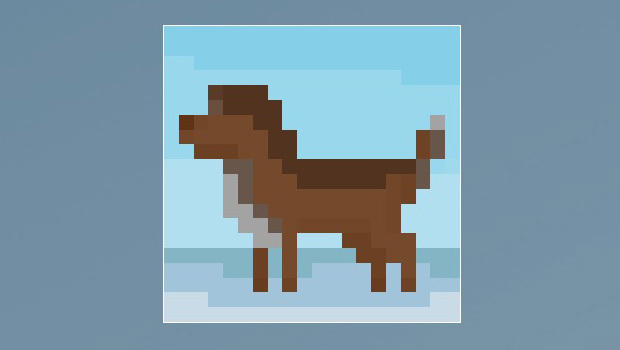 That’s part of what makes Pictopix such a welcome game: it’s very reminiscent of Picross e in terms of quality, but it’s a PC game with such low system requirements that it should be able to run on just about any machine. Finally, there’s a well-made picross game that’s available to the masses. And it really is a high-quality game. The user interface is slick and minimalist, allowing you to enjoy the puzzle solving with as few distractions as possible. The controls are simple – left click to fill a square, right click to put a cross (indicating a blank space). Controller and keyboard are supported, too, but I never actually tried them because the mouse controls work so intuitively. Pictopix also sports a few simple tools that remove pointless inconveniences, making the whole puzzle-solving experience far more fluid. As with Picross e (but unlike any other picross game I’ve played), the game is smart enough to only fill in unmarked cells when you’re filling in a whole line at once. For example, say you’ve coloured in the two squares in a row with the clue “2”, so you know the rest of that row should be filled with crosses; you can just draw a line of crosses from start to finish, and Pictopix will ignore those two filled squares, rather than turning them into crosses. The Smart Slide option makes a world of difference by forcing your drawing into straight lines. With this turned on, you don’t have to worry about accidentally straying when you’re trying to colour in a long string of cells at once, removing a lot of unnecessary errors. If you do make a mistake, it’s easy enough to fix them up by clicking on the cell(s) again, and undo/redo buttons can help with bigger screw ups. You can also get (optional) hints, by way of an option that highlights solvable rows and columns. With this turned on, you can see at a glance where to start chipping away at the puzzle, without the need to go through line by line. Naturally, using this hint comes with a cost – each puzzle has three awards to earn, but you can only get one of them while using hints. Another option that’s marked as a hint – though I’d say it’s more of a convenience tool – has the game dim completed clues once they’re solved. Say you’ve got the clue “1, 3, 5”, and manage to isolate and fill in the 1 and its surrounding crosses. With the dimming option turned on, the “1” part of that clue then gets greyed out, so that you can see at a glance which parts of each clue you’ve already dealt with. It saves a lot of time, and I wouldn’t say it makes puzzles easier in the way that the solvable rows hint does, but it’s nonetheless treated as a hint – so don’t expect to earn many awards if you use it. There’s clearly a lot of effort put into making Pictopix as user-friendly and approachable as possible, but all of that would be moot without good puzzles. Luckily, that’s not a problem that this game has – the puzzle design is impeccable, never relying on guesswork the way so many picross games do. Pictopix has 150 puzzles, ranging from 5×5 to 25×25 in size, and covering all manner of themes and pictures. If that’s not enough, there’s also a workshop mode that allows players to create and share their own puzzles. This really is Pictopix’s standout feature: not only does it allow for a potentially endless supply of new puzzles (assuming the community keeps creating), it’s also a great tool for budding puzzle designers to get started. The workshop can check for solvability, which is vital, and also allows you to import PNG files to form the basis of your puzzles. There are a few things I’d like to see added to Pictopix, be it with updates, DLC, or some sort of sequel – namely, bigger puzzles. Currently, puzzles only go up to 25×25; that’s fine, but with a good designer – which Thomas Lerdy clearly is – there’s nothing stopping picross from getting much bigger, and more challenging and fun to solve as a result. Even if this was only available in the workshop, it’d open the door to so much more picross joy. Some sort of multi-part puzzles would also be most welcome. Picross e calls these “Micross”, other games call them other things, but the idea is the same: you have a collection of puzzles, each of which form part of a much bigger picture. You might, for example, have four 15×15 puzzles, but each one is just a corner of a 30×30 image. It’s a fairly simple setup that allows for massive puzzles that form detailed, beautiful images, but without the added complexity that comes with trying to design a single solvable puzzle on that massive scale. These are just my wishlist features, though. Even without them, Pictopix is a delightful game that anyone with any interested in picross should buy. Its clean, simple, intuitive UI and control scheme removes all distractions from solving puzzles, and that’s exactly what you want out of a game like this. Top that off with a massive collection of puzzles and a fantastic workshop mode, and you’ve got one of the best picross games available. Jupiter Corporation finally has some competition. Pictopix is developed and published by Tomlab Games. It’s available now for PC, via Steam. A press copy was supplied by Tomlab Games for this article.